here in san francisco bay area berkeley ca, was that a good idea i miss the zip off the line but i love the clubsport looks so maybe one day i will swap out the motor or should i leave it alone. Does this manual come with customer service, e.g. answering follow up detail questions by email, how this or that compare to a 2.8 swap, etc? I saw your pix. I think I would rather just buy your car instead. As an owner of my manual, you would be offered not only e-mail support, but phone support as well. This has always been the case since I sold the first copy several years ago. Of all the manuals I have sold, I have only had questions from two people. When I get this feedback, I try my best to incorporate these details into the new versions of the manual, because I'm not always available right away to help you out. It is quite comprehensive at this point, but I will continue to improve it as best I can with my own experience as well as the experience of others who have done the swap to make the best swap resource as possible. You can save up a few bucks each month and get it in time for Christmas! After the first of the year, it may remain the same price, and it may not. Paper and other consumeables are not getting asny cheaper, and I don't want to go with the lighter grade, less-bright paper, as it doesn't do the photos justice, and won't hold up as well to the greasy-handed shop environment. I think the text covers it well, but the photos really help when you can see exactly what I'm talking about. As more pages go into this thing, more paper and toner is required as I'm sure you can imagine. I am OK with this for now, but I think if I exceed 80 pages (which will happen of I add just a few more detail photos) I may have to add a few bucks to the cost. Still, compared to the other options out there, a real bargin for an engine swap manual, specific to our cars! J!m... have you considered having your book printed by CafePress or some other similar company?? I have, and it doesn't make any sense. As soon as I pick up another detail that will make the manual better, I insert it before the next copy is sold, and the manual is updated. I only have the latest version saved- I don't keep the archive of the old versions. The manual itself is also the place I keep all my swap data- I don't have other files with other information- it's all in there! I should have kept a record of up-dates over the years, but unfortunately, I did not. It is almost twice as many pages now as it was in the first version. Back then, I had not yet done the rear sub-frame up-grade, or sorted out all the details with the front suspension up-grade. That is all in there now, but could be better illustrated through photos. Therefore, I also plan to do a bit more photography on my car, to help illustrate these details, and I have also considered tearing into the wiring harness to see exactly how the dealer corrected the other minor electrical problems that were addressed on my car. The dealer has to do the EWS/ECU alignment, and if you tell them the other things in the manual that also need to be addressed (which depends on which engine you have), they can do it (usually), so for now, it is working fine. 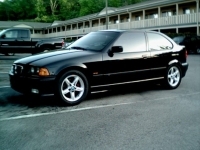 I also know exactly how to by-pass the EWS system to eliminate the need for the dealer, but I will not publish that at this time so there is not a sudden rash of stolen E36's out there... Possibly later I will add this information, as I have to check what my liability might be with my attorney before I do. I'd love to do a PDF version, as you can then jump to the section you want from the index (the manual is fully indexed, by the way) and you could get it as fast as you send PayPal, but there are so many boot-leg EVERYTHINGS on eBay, and I don't want all my years of hard work to go out the window. By the way, with all the copies I have sold, I still have not scratched the surface of my initial costs to do this job... The sales numbers are not there to justify a conventional publishing house for this right now. I am not getting rich selling a manual every few months on average. Well, Jay, it's up to you. At this point in time, the swapped ti is NOT a replacement for the M3, as a used M3 can be had for less than a used ti. As I did, you have to do the swap for the love of the car, not to save a few bucks off the price of an M3, and CERTAINLY not to try and re-sell the car for a profit. That trick never works with most cars, and not these in particular. Thanks for the praise, Thanh. I do my best! If you see anything that needs to be adressed or made more clear, just let me know and I'll take care of it. you have to do the swap for the love of the car, not to save a few bucks off the price of an M3, and CERTAINLY not to try and re-sell the car for a profit. i'll be buying the manual... soon. since it's fairly comprehensive atp, would you ever consider doing a small groupbuy for custom-made manuals in hardcover? i'll lay it out for ya. i'd be down for a very limited first edition copy. Every manual is unique in that they are all serialized to a single owner. In other words, limited edition of one copy for each one. Hardcover will be too expensive, particularly in such low quantities.